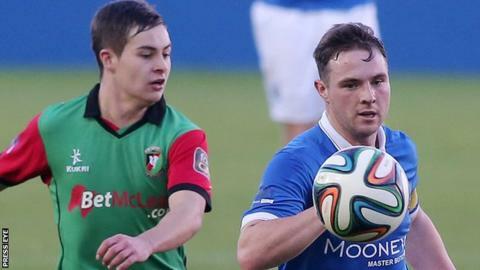 Glentoran substitute Johnny Addis scored a late equaliser to deny Linfield victory in the Belfast derby at Windsor Park. Former Hibs and Ross County forward Sammy Morrow headed the Blues into the lead after just two minutes. Fra McCaffrey's shot pulled the Glens level but Stephen Lowry restored Linfield's lead in the 34th minute. Addis, just on for Marcus Kane, scored in stoppage-time with Linfield claiming there had been a hand-ball. Victory for Linfield would have taken Warren Feeney's men level on points with Portadown and champions Cliftonville at the top of the table. Instead, the Blues are two points behind and actually slip one place to fourth in the Premiership standings. It had all started so well for Linfield as Morrow was left unmarked to head in his second goal of the season after Jamie Richards had delivered a cross from the right wing. Glentoran equalised when Niall Henderson's ball in found McCaffrey who worked to create a bit of space in the box and drill a low shot past home keeper Ross Glendinning. Linfield regained the lead when striker Andrew Waterworth held he ball up before playing the ball into the danger area for Lowry to finish from close in. Glentoran pressed hard in the second half and salvaged a point in the 92nd minute through the disputed striker by Addis. He netted after Henderson's initial shot had been diverted into his path. The ball did appear to strike Stephen McAlorum's arm but referee Robert Crangle ruled that it had not been deliberate.